Frank Furness was born in Philadelphia in 1839, the son of William Henry Furness, the Boston-born pastor of the city’s first Congregational Unitarian Church, and Annis Pulling Jenks. Ralph Waldo Emerson was one of William Henry Furness’ closest friends. Abolitionists William Lloyd Garrison and Wendell Philips graced the Furness parlor; and the family basement served as a stop on the underground railroad. 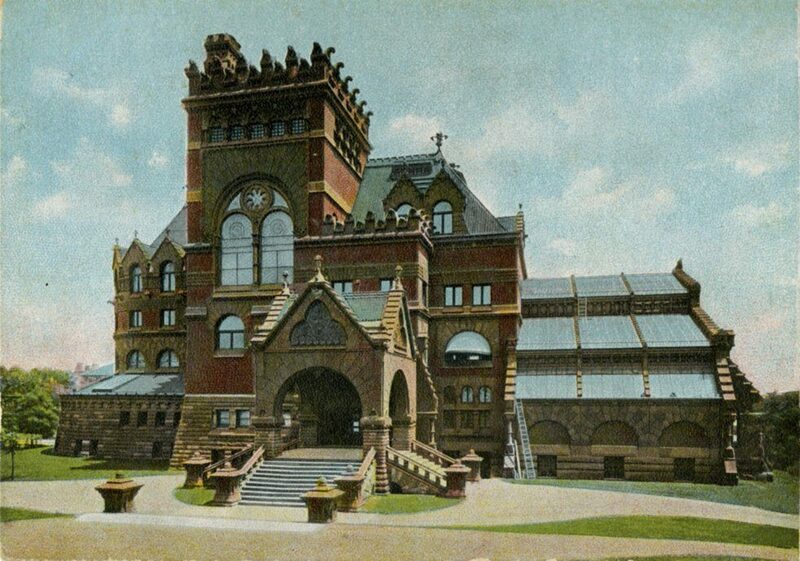 Frank Furness was educated at private schools in the city, but never attended a college or university. Instead, in 1857 he was apprenticed to architect John Fraser. Two years later he entered the New York studio of Richard Morris Hunt where he learned the eclectic medieval form which he would use throughout his career. After serving in the Union cavalry for most of the Civil War, Furness returned to New York to work briefly for Hunt. When Furness returned to Philadelphia in 1866, he received his first commission for a new church in the Germantown section of Philadelphia. The following year, Furness entered into his first architectural partnership, joining established architects John Fraser, his former mentor, and George Hewitt. Shortly thereafter Fraser left to take a government job, and the firm of Fraser, Furness, & Hewitt became Furness and Hewitt. During the early 1870s this team designed the Pennsylvania Academy of Fine Arts, the commission which established Furness as one of the major artists of his generation. It was also during this period that Louis H. Sullivan worked briefly in 1873 as an apprentice with Furness and Hewitt. Hewitt left the firm in 1875 (a year before the dedication of the Pennsylvania Academy). Furness then worked alone until 1881 when he made his chief draftsman, Allen Evans, a partner in the firm of Furness and Evans. Five years later the firm changed its name to Furness, Evans, and Company, as it took on a number of young partners. Furness was a cofounder of the Pennsylvania Institute of Architects in 1869. From 1875 on, Furness moved away from European revival styles, looking instead to the American West and to the American industrial age as inspirations for his dynamic and original buildings. He found an appreciative audience in industrial Philadelphia. By the time of his fiftieth birthday in 1889, Furness had designed more than three hundred buildings in Philadelphia, including a number of major city landmarks. During his career he designed numerous stations for the Pennsylvania and Baltimore and Ohio Railroads, as well as banks, residences, office buildings, and churches. Frank Furness’ contribution to the University of Pennsylvania was the University Library (now the Fisher Fine Arts Library) built by his firm of Furness, Evans, and Company. At the time of its commission, it was promoted as the finest collegiate library in the world; the cornerstone was laid in 1888 and the building was dedicated in 1891. For a time this library fell out of favor and was almost demolished, but it is now recognized as a masterpiece of Philadelphia’s finest Victorian architect.